In late fall 2000, Dave Truesdale convinced me to reprint Edmond Hamilton’s first published story, the creepy pulp tale “The Monster-God of Mamurth,” from the August 1926 issue of Weird Tales. Harlan Ellison told us “it’s an awful story,” but what does he know? It has ancient lost cities, valiant explorers, horrible curses, and seriously spooky giant spiders. I loved it. So I dutifully tracked down the rights, and discovered they were controlled by the Pimlico Agency in New York. In short order, I found myself on the phone with a guy named Kirby McCauley, negotiating the right to reprint the story in the second issue of Black Gate for $200. Now, I’d certainly heard of Kirby McCauley. 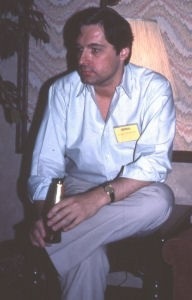 He was Stephen King’s first agent, and King had famously related some of the guidance McCauley gave him early in his career. More interesting to me, McCauley was also an accomplished editor. His Dark Forces was easily the most acclaimed horror anthology of the 1980s (it included Stephen King’s The Mist, among many other notable stories.) So in between our business dealings, I mentioned to Kirby that I was a fan. He was very gracious and surprisingly easy to deal with. For a good many years, Kirby McCauley was one of the most successful agents in the industry, with a client list that made his peers green with envy. George R.R. Martin said “Kirby revolutionized agenting in SF and fantasy and horror,” and that was no exaggeration. However, McCauley’s career suffered a significant downturn in the late 90s, and he lost most — but not all — of his biggest clients. Kirby McCauley passed away last weekend, and his death has largely been ignored by the industry. But today, I found a lengthy appreciation written by his client and friend George R.R. Martin. It’s definitely worth the read, both as a remembrance of a man who made a big difference in the industry and as a wonderful snapshot of what publishing was like in the 70s and 80s. I agreed to let Kirby McCauley represent me… That was the best decision I ever made. In 1994, when I sent him two hundred pages of a fantasy I had been working on for a few years, and asked him if he could maybe sell it for enough money to get me out of television, he chuckled and said he thought maybe he could…. Kirby sent the book all over New York, got six publishers to submit offers, and soon had two of them bidding each other up and up until… well, Bantam won, and I popped a bottle of champagne, bid farewell to television, and set to work on A Game of Thrones. Among his many other accomplishments, Kirby McCauley helped found the World Fantasy Convention, created the World Fantasy Awards, and chaired the first convention in Providence in 1975. He was a fan as well as an industry insider. Kirby McCauley passed away on August 30, 2014 of renal failure brought on by long-term diabetes. He was 72 years old. Read George’s excellent appreciation here. Sad! Dark Forces was an amazing anthology — the story from it that sticks to me to this day (possibly even more than The Mist) is the Mathesons’ Where There’s a Will. I don’t remember that one… but I probably should. I remember “The Enemy” by Isaac Bashevis Singer (because it confused the heck outta me when I first read it), and of course THE MIST, which I still consider one of Stephen King’s finest works. Terrible news! I only found out when I checked today’s birthdays on ISFDB. Terrific piece by Martin; glad to finally have a picture of Kirby himself.